I predict my couch will continue to feature prominently on this blog. And, of course, I'm bringing a stack of books with me! As you can see, I managed to pick almost all big, clunky hardcovers. (I didn't need to bring clothes, right?) If I had my druthers, I'd be bringing more than four, but I'm trying my best to imagine that there will be moments I won't be reading. I don't have any real goals for this stack. I'd like to finish my Ivanhoe read-along on time, but, as I mentioned over the weekend, I'm going to try to make these two weeks as low-stress as possible in terms of reading (and blogging). Whether it's a single page or all four books, whatever I accomplish is good enough for me. Parable of the Sower, by Octavia E. Butler—I teased this one for you guys last Tuesday, but since then, I haven't touched it! 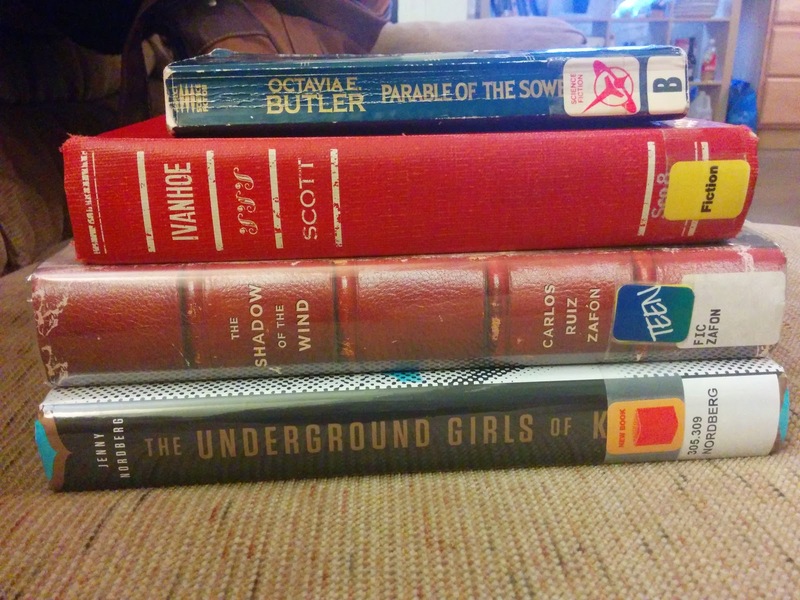 I've been on a real spec-fic/sci-fi kick this year, particularly when it comes to women authors, and I hope to continue a great streak of reading with Butler. Ivanhoe, by Sir Walter Scott—If you've been following my blog for any length of time (read: even since yesterday), you'll know I'm participating in an Ivanhoe read-along with Rachelle of The Reading Wench. The laid-back reading schedule means I've been moving through this one slowly, which I have found to be both good (I only have to digest small chunks of the story at a time) and bad (it can be sloooow). The RAL ends on January 4, but I'm hoping to vanquish this tome before the new year. The Shadow of the Wind, by Carlos Ruiz Zafón—This one comes highly recommended by Karsyn of KaKiKoJoKa (it's one of her favorites of the year!). From the dust jacket and Goodreads blurbs, this sounds like just the sprawling, fantastic adventure I need to counteract some of the heavier nonfiction reading I have been doing lately. I'm really looking forward to this one. (And, no, I have no idea why this one is in my library's teen section). The Underground Girls of Kabul: In Search of a Hidden Resistance in Afghanistan, by Jenny Nordberg—Ah, speaking of heavy nonfiction reading... I wasn't originally interested in this one, after seeing it make its rounds during Nonfiction November. I must not have been reading anyone's synopses closely, because I thought this was a book about child prostitution (interesting in its own right, of course, but not really what I'm looking for at the moment). I forget whose review it was that finally made me realize that this book is about a whole lot of things I care about—oppression of women, problematic gender norms, and a big old "screw you" to both—and I immediately snapped it up from my library's new nonfiction shelf. I can't wait to dig in to these women's stories. What are you guys reading over the holidays? Does anyone else take an unrealistic number of books with them on vacation? Enjoy your reads and Florida. The Shadow of the Wind is one of those books that I have been meaning to read for quite a while. Any quotes I have seen from it have been amazing. It's been quite good so far, and beautifully written! I've recently put it down for a brief break, but I look forward to going back to it.